GP 4 is specifically designed for Four Stroke street, road race motorcycles and dual sports which incorporate the same lubrication for the engine and transmission. 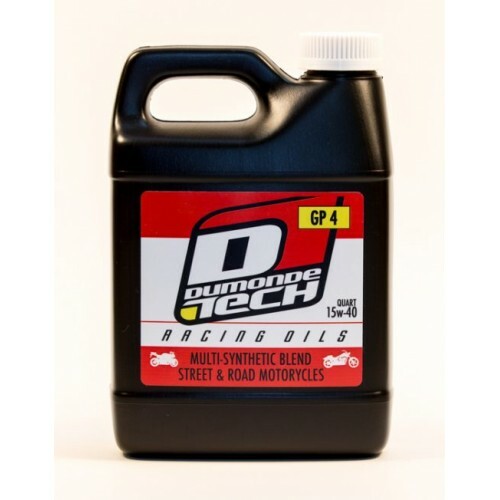 GP4 uses the highest grade base stock along with advanced chemical research not used by other brands to blend only the finest additives to produce an oil that protects and cools the engine long after conventional 4 stroke oils have broken down. This is extremely important, because using other lubrication packages which are not specifically designed for this application, may damage engine or transmission components. GP 4 protects and cools engines. Eliminating preignition which causes damage and performance lose. GP 4 also noticeably increases ease of shifting of gear box and eliminates clutch fade. 30w, 40w, 50w Can be made available upon special request. Please contact us.